The Farms that I visited on the summer tour were: Imperial Arabian Stud (Wiltshire), Klinta Arabians (Ireland), Star Arabian Stud (Lincolnshire), Al Waha Arabians (Surrey), Blue Moon Arabians (Surrey), Milla Lauquen Stud (Norfolk), Highfield Stud (Wales), Coed-y-Foel Arabian Stud (Wales), and Templars Stud (Lancashire). Combe Farm Open House (Devon, Aug. 5, 2001). I will present a sample preview of what I will see at each farm below. 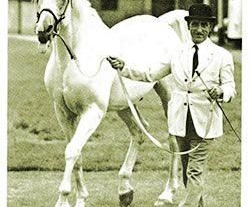 The former home to Hanif (Silver Vanity x Sirella), Geoffrey Plaister has I believe the largest band of pure Crabbet Arabians (over 30) in all of Great Britain. Geoffrey has kept to pure Crabbets for a very long time, does not advertise and has had success in the show ring with horses he has bred. Many of his horses have been loaned out to other Crabbet breeders. I will see offspring of Hanif, Shabash, Golden Silver, Nefeuret, Ludomino, and Magic Sun. I have offered a sample pedigree below. Geoffrey has also mentioned that he would like to take me to meet Roger Upton, Hanif’s longtime show handler and twin brother to Peter Upton. Sherban and Maureen de Popp have been avid Crabbet breeders for many decades. They had lived in Argentina when they first began acquiring Crabbet blood and brought some of their horses back to the UK. Sadly, Sherban just passed away at the end of June. He had been in regular contact with me throughout the years and had tried to form a worldwide Crabbet Trust organization, of which we were to discuss in detail. They had imported a Doyle stallion in the early 80s, KILDIMO and some of his offspring should be there. This photo of RAFID (Indian Magic x Sunset) a 1970 stallion was taken by myself when I was last at Milla Lauquen Stud, I believe in 1985. He is still alive, but recently their other stallion St John (Bright Shadow x Siretta by Silver Vanity) passed away. Maureen tells me she still owns over 20 head, however, the direction the stud will now take is rather uncertain. Alistar Leslie owns Mezziah (Zircon Nazeer x Minuette) a gray 1994 stallion. Mezziah has been Champion 3 yr old Colt AHS Malvern. Alistair’s breeding program consists of extremely fine moving horses that combine Courthouse, Crabbet, Russian and some American bloodlines. 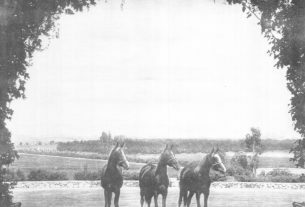 His 1989 gray mare Lalique DS pictured right is by Menes out of the Salon daughter La Salone Ltd whose dam is Bint La Quinta (Bask x SX La Quinta). Lalique was 1999 1st British National Champion Mare AHS Malvern, Champion Pure Bred Ridden AHS Malvern and Overall Supreme Champion of the Show! His mare Somara is also by Zircon Nazeer out of Somrah, one of the last pure Courthouse mares bred by Joanna Maxwell and cousin of the only English World Champion Siwah. 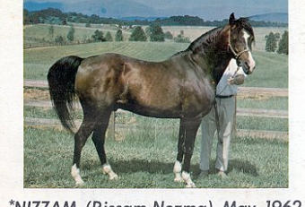 Somrah’s pedigree contains such well known horses as Sobha, Berk, Safarjal, Rissla, Irex and Sappho. In Wales, Susan Murphy has a successful 1994 liver chestnut stallion by the name of Sorrento (Imad x Sarafina) who is nearly pure Crabbet, save 2 lines to Russian. He has just won Arab Champion at the prestigious Royal Welsh show this past July. Previously, Sorrento was International Junior Male Champion, Reserve at UK Towerlands, NE Region Junior Male Champion, Wales and West Junior Male Champion. Susan also has his paternal half sister, Sumadi, pictured left, and a beautiful part Egyptian/American/Crabbet filly, Infanta whose paternal dam is a Kaiyoum daughter out of a Raffon daughter. 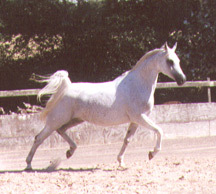 Klinta Arabians in Naas, Ireland breeds Pure Crabbet Arabians. Gunilla and Geoff Hamer stand the 1976 stallion Shabakka (Silver Flame x Mona), the 1991 stallion Klinta Nader (Indian Reflection x Sapphie Star), the 1995 stallion Klinta Nazr (Fanto x Star Solitaire) and the 1996 stallion Klinta Bashir (Nefeuret x Star Solitaire). The maintain a pure Crabbet breeding program without the blood of Dargee. What I have so far seen of Arabians has been very impressive. The substance, quality, bone and tail carriage have all been retained. There are many pretty headed pure Crabbets too. I have seen pure Crabbets at Imperial Arabian Stud, home to the Hanif (Silver Vanity x Sirella by Dargee) now deceased. Also just arrived at Imperial Stud was Indian Banner, a champion ridden stallion (Silvadoris x Xarifa) on lease to Imperial. The mare band there is quite impressive. I have seen Crabbet-crossed on Russian and the Courthouse stallion Spearmint at Al Waha Arabians. Al-Waha also has quite a few pure Crabbets in their band. Al Waha is owned by Jane Kadri and she is also the breeder of IMAD who has done so well this year. 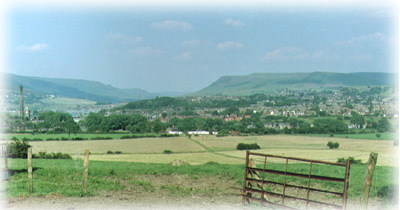 (He is owned by Coed-y- Foel farm, Diana Whittome). Jane has a yearling half brother by Spearmint out of Ivory Wings, dam to IMAD that is for sale. I have viewed a top riding mare, Lalique, owned by Alistair Leslie, perform and win her division and go on to try at the championship. She didn’t win it, but a Crabbet/OE stallion by Silvern Idyll did. Lalique is Crabbet/Egyptian/American lines. Alistair also owns a very pretty Zircon Nazeer son, Mezziah. I have ridden the Dorian son, Silver Dollar, a seasoned 100 mile endurance stallion belonging to Kevin and Susan Hawes in Ashdowne Forest, the area that A.A. Milne wrote of Winnie The Pooh and I crossed Poohsticks bridge while riding this horse. I stayed with Dave and Marianne Smith and viewed their General Gold son, King General and two of his daughters. Their neighbor, Chris Blyth has two very pretty offspring of Mezziah. Just lack of time and space at present. Also I went to the Towerlands International Arab show and saw many of the top Arabians from the UK and Europe competing ‘American style’ with hoopla, music, and American poses. I saw the pure Crabbets of Milla Lauquen Stud, in Norwich, including the 31 year old mare, Blue Sylphide and the Indian Magic son, Rafid, now 30. At Star Arabian Stud in Lincoln I saw the stallions Astar and Star Silver as well as their offspring. Star Arabians two foundation mares Aurora (Oran x Shadowlight) and Selina (Hanif x Dancing Diamond) have passed on, but their influence is still very much alive. 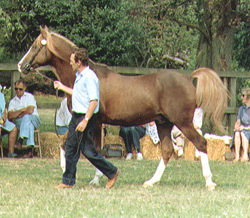 In Wales, at Coed-y-foel stud, I witnessed this year’s Supreme British National Champion Ridden Stallion, Imad (Golden Cavalier x Ivory Wings) performing dressage. I saw several of his get, including the bay son and Royal Welsh Arab Champion stallion, Sorrento, owned by Susan Murphy. SEPT. 7 IRELAND. I visited Klinta Arabians owned by Geoff and Gunilla Hamer. Gunilla has pure Crabbet Arabians without using Dargee blood. Her stallion Shabaka is by British National Champion Silver Flame out of the Naseel daughter Mona. She has two offspring (mare and stallion) sired by Indian Reflection which is rare blood. She has a very nice Neuferet son (Klinta Bashir) and a colt foal by Shabaka both out of Star Solitaire (Indian Reflection x Sapphire Star). She has two foals expected next year and some of her stock is for sale. While in Ireland, I went to see the Irish National Stud (Thoroughbreds) and to the Thoroughbred races at Leopardstown outside of Dublin. Crabbet did very well this year at the British Nationals. Besides IMAD taking British National Supreme Champion Ridden Horse, his son, Silver Charade (x Silver Czarina) took Novice Pure Bred Ridden Champion. 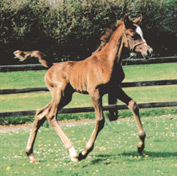 OAS Panache, a chestnut weanling filly out of the pure Crabbet Mare, Rose of Bediya, was named British National Foal Champion. Incidentally, Rose of Badiya must have been delighted as I was told she showed off her marvelous movement and wowed the crowd. Kharuss Ibn Sadik by Binley Stud’s Prince Sadik won Purebred ridden Gelding Champion. Binley’s 3 year old filly Sa’Ira took 2nd Place in the National Futurity Class, shown by her owner. The Champion Junior Ridden Stallion PHA Silvern Risalm is by Silvern Sceptre x Rislina. The Ben Rabba influence is still winning through his son Aurelian. His daughter Aurellia x Crystal Shadow won Champion Mare or Gelding Ridden by a child.